London is world famous for its ‘West End’ shows, for many people the theatre is the main reason for a visit. 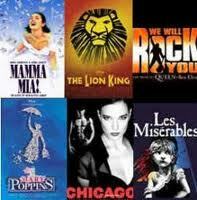 The number of shows in London are many, covering musicals, comedy, plays and classics and are spread across London. The mainstream commercial theatre is centred in the West End around the Covent Garden and Leicester Square area, though top selling shows will also be elsewhere. The most popular shows are often sold out well in advance, especially at the popular weekend shows. The top shows, tend to be musicals. The current favourites that everyone wants to see are sold out weeks, sometimes months ahead, especially for popular weekend shows. Nearly all shows start between 19:30 and 20:00 and a typical show will last between 2 hours 15 minutes and three hours. When you leave the theatre you will typically have an hour before the last Underground train runs. There is also a good night bus network that will get you to all the main hotel districts if you want to eat or drink afterwards or visit a nightclub. When you purchase a theatre ticket, normally the best way to purchase if you can is direct in person from the theatre, for most people this is impractical. It is not generally possible to purchase tickets direct online from the theatre, there are no e-tickets. Tickets are sold through agents of one kind or another. You can either collect the tickets or have them mailed to you. When you purchase a theatre ticket you should be made aware of the face value, this is the normal price of the ticket if you bought direct at the theatre. Agents will normally charge you more than the face value, this is their commission and/or mailing fee. If there is an offer you will pay less than the face value of the ticket. Discount West End Theatre Tickets Around Leicester Square in the heart of the theatre district are a number of kiosks selling ‘last minute’ discounted tickets with unsold seats for that evening. The official half price discount office should be your first port of call. It is on the south side of Leicester Square itself, (pictured right) and is hard to miss. There are other kiosks like that pictured below, all around Leicester Square. Don’t expect to pick up tickets for the popular shows here they are normally sold out well in advance. Also it may be that only the expensive seats for a show may be made available discounted – there may be cheaper stall seats available from the theatre. If there is a particular show you want to see then book in advance, don’t gamble on the off chance that you’ll pick up something cheap on the day. As said before the very popular shows are sold out well in advance. If you want to check out the entire entertainment scene in London, covering comedy clubs, film, concerts and ballet as well as mainstream musicals then pick up a copy of Time Out in London. a weekly London entertainment magazine. A good on-line source of discounted theatre tickets is Lastminute.com, Lastminute.com as well as doing discounted tickets also do deals combining theatre with things like restaurant meals near the theatre. A great way to both save money and get hold of tickets otherwise not available is to purchase through a consolidator. These agents buy up blocks of seats from the theatres well in advance and bundle them with discounted hotels. The is a large choice of hotels from the most frugal to 5 star luxury. Posted on September 4, 2012, in Discount London, London Discount Theatre, London for kids, Travel Tips, UK Tourist News, Visit London and tagged London Hotesl, West End. Bookmark the permalink. Leave a comment.